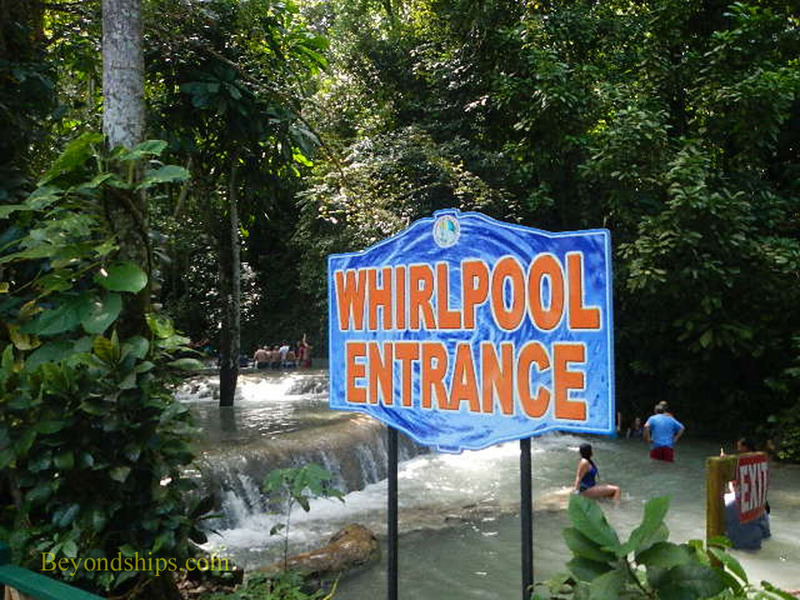 Dunn's River Falls is Ocho Rios' best known attraction. The falls extend some 600 feet, cascading down over a series of rock faces intermixed with much calmer terraces. They end at a narrow sandy beach where the river joins the sea. The Falls were used as a set in the first James Bond film “Dr. No.” Sean Connery and Ursula Andress cavorted in the river water and hid among the rocks as they alluded the villian's henchmen. While the Falls are still beautiful, do not expect the isolated, untouched tropical paradise depicted in the film. The Falls are now part of a highly developed park with restaurants, a live music stage, shopping stalls, a children's playground, a gazebo for weddings and large parking areas all set on nicely landscaped grounds. Furthermore, inasmuch as this is the area's most popular attraction, there are lots of people. Still, the area immediately surrounding the Falls retains much of its natural beauty. It is shaded by tall trees and the path that runs along the river blends in well with the surroundings. 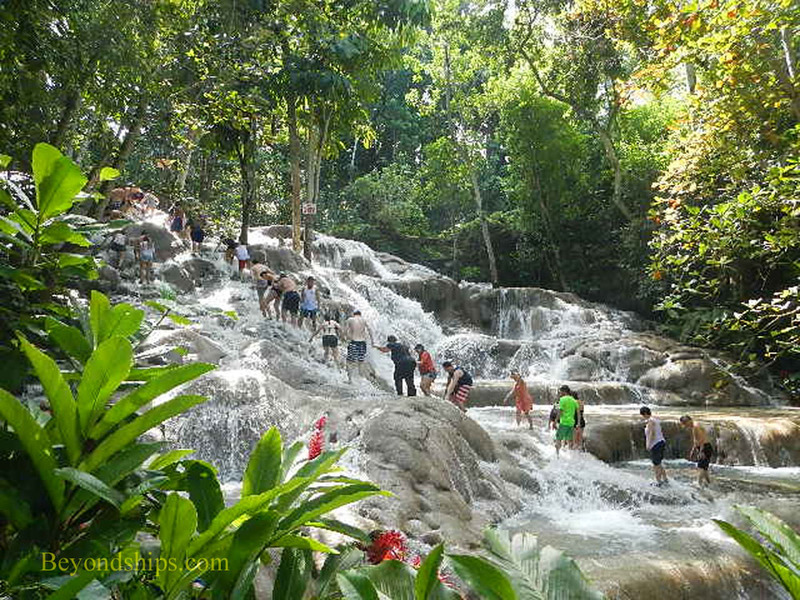 Most excursions to Dunn's River Falls promote “climbing” the Falls. By this they mean getting in the water at the beach end of the river and scrambling over the rocks to each of the terraces until you are finally at the top of the Falls. 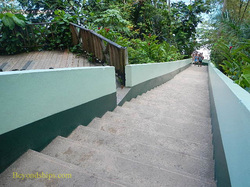 (There are a number of entrances and exits along the way that enable visitors to have a more abreviated climb). To make the ascent, most climbers use one of the official guides. The guides lead chains of 20 or so climbers who hold hands as they make their way upwards. They also act as cheerleaders encouraging the climbers to participate in various chants, songs and screams. The climb takes about an hour with pauses for photos and videos (available for a fee). 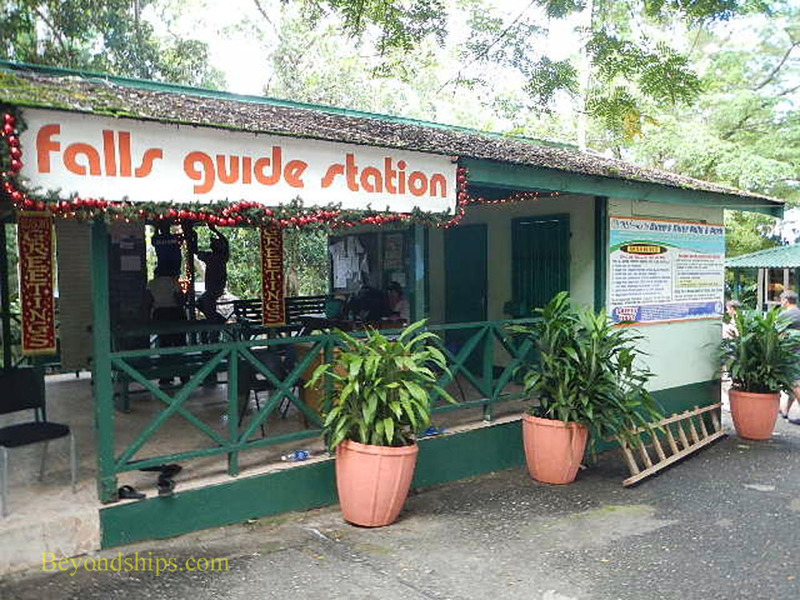 Climbers are assigned to an official guide at a small building along the paved path that leads to the Falls. However, independent locals also act as guides for small groups. All the guides expect a tip. Most climbers seem to enjoy the experience. You know you are going to get wet and there is a lot of laughing as it happens. Even among strangers a group spirit emerges as the climbers pursue a common objective. You should be careful climbing as the rocks are slippery with deep hidden holes. The current can be fast, especially by the cascades. Water shoes are helpful. Swimwear is essential as you do get wet. There are changing facilities and lockers (marked use at your own risk) at the site. 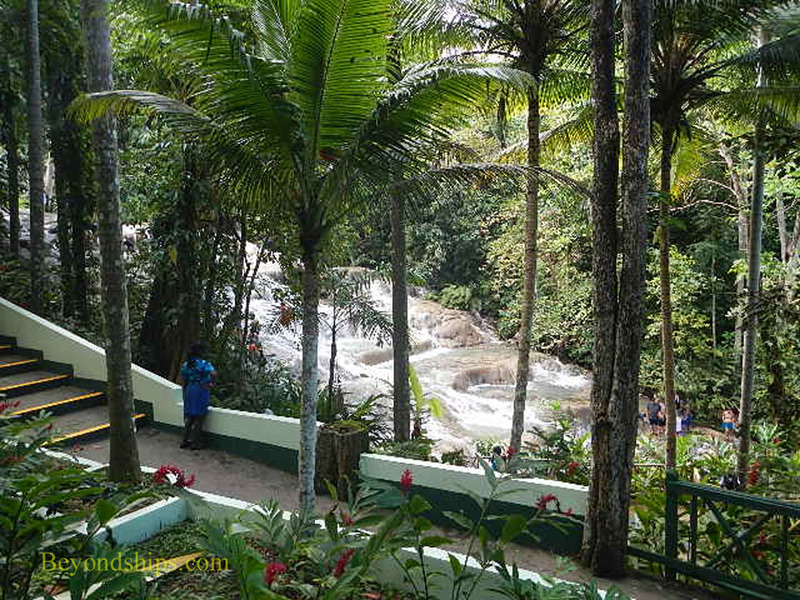 While the excursion literature implies that nearly everyone climbs Dunn's River Falls, our experience was that just as many people observed the Falls from the path that runs beside the Falls as went in the river. From here, you can experience the natual beauty of the Falls and be entertained by the antics of the climbers, all while remaining dry. 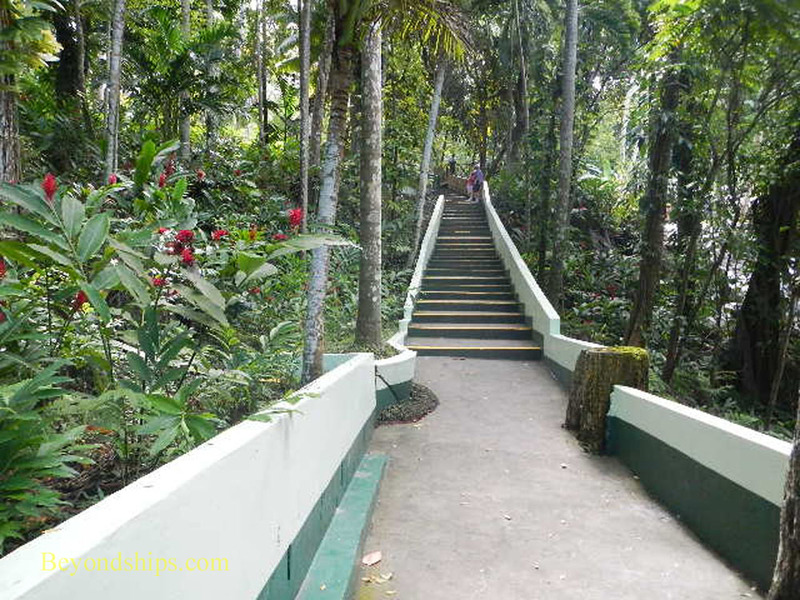 The pathway consists of a paved, sloping walkway punctuated at various points by stairs and paved platforms. It will take you all the way down the hill to the beach. 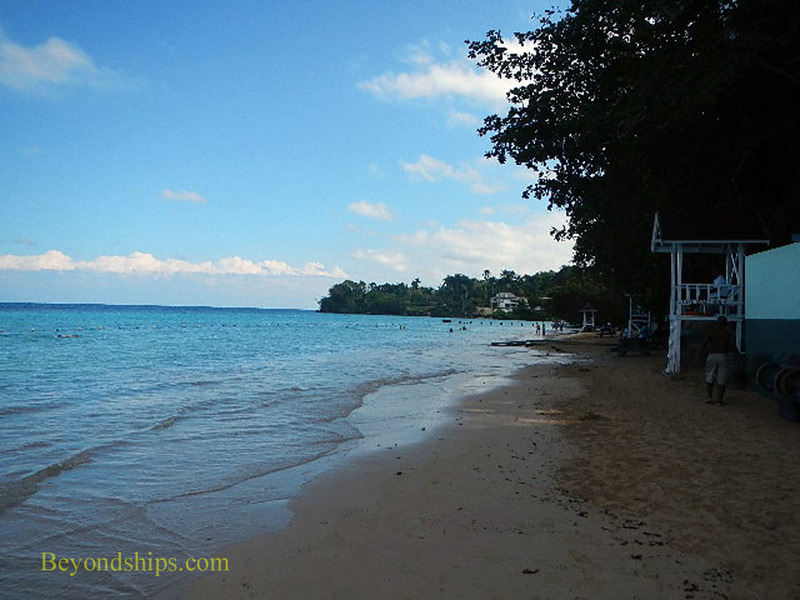 Although narrow, the beach is pretty with trees shading a golden sandy strand that is lapped by the blue Caribbean. There are facilities here including a cafe on a terrace overlooking the beach. 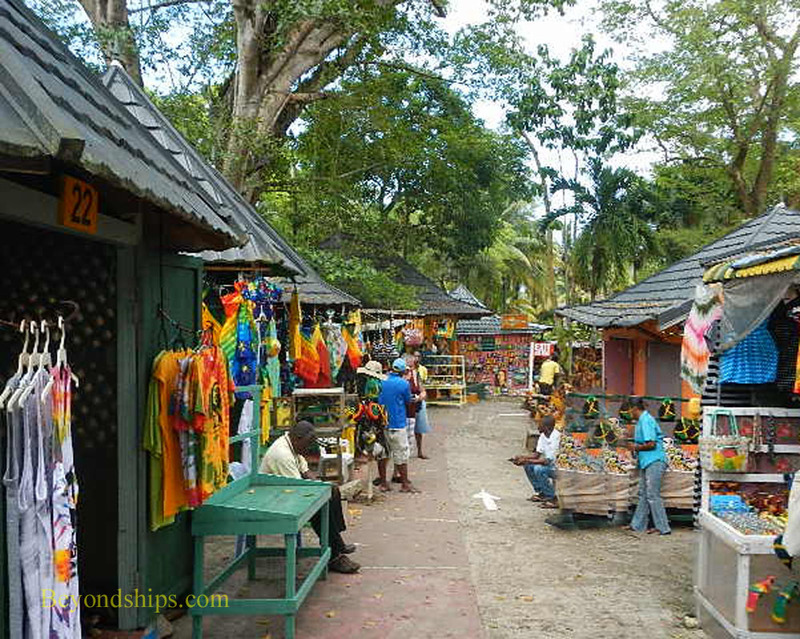 Dunn's River Falls is included on many cruise ship shore excursions. However, visitors can also go there independently. 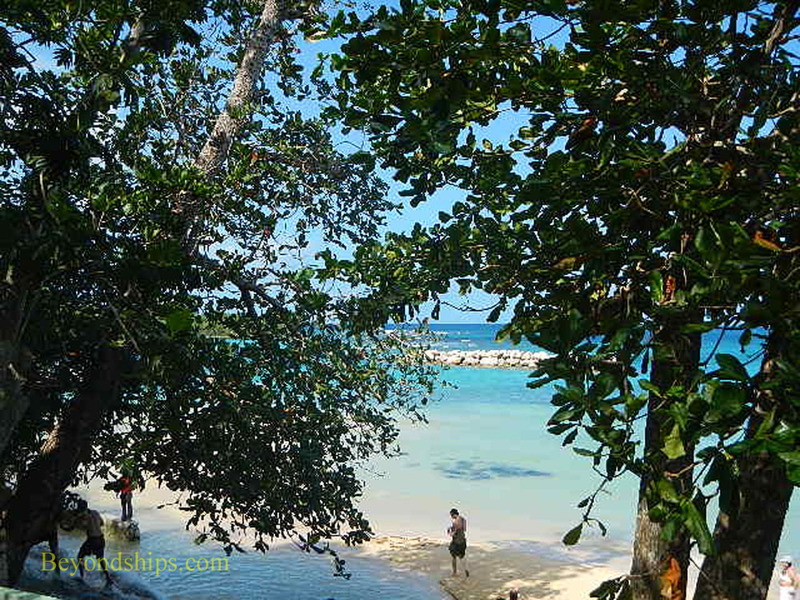 It is about ten minutes by taxi from the center of Ocho Rios. There is an admission fee. 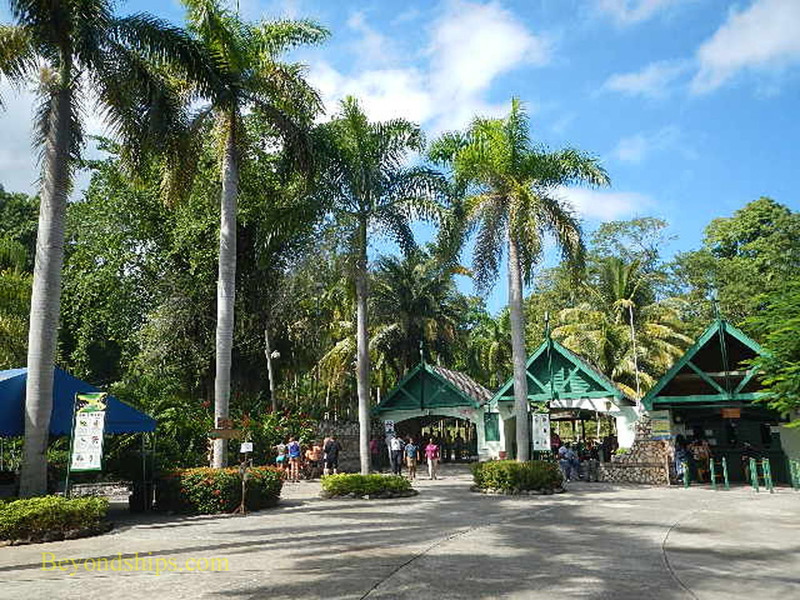 Above: The entrance to Dunn's River Falls Park. 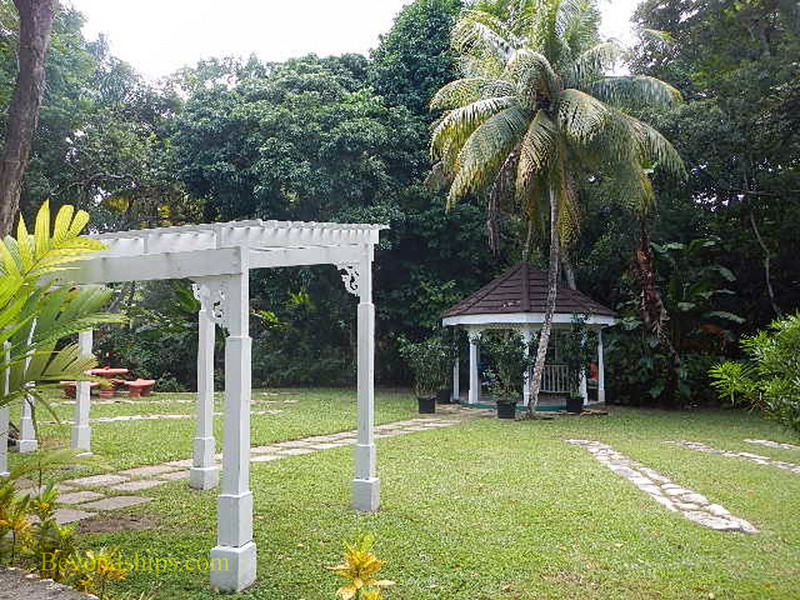 Below left: The Park's wedding gazebo. Below right: The craft market. Above: A chain of climbers ascends the Falls. Below left: The guide station where groups form and the climbers meet the official guides. Above: The pathway along the river. Below left: Inasmuch as the path goes down a hill, there are many steps. 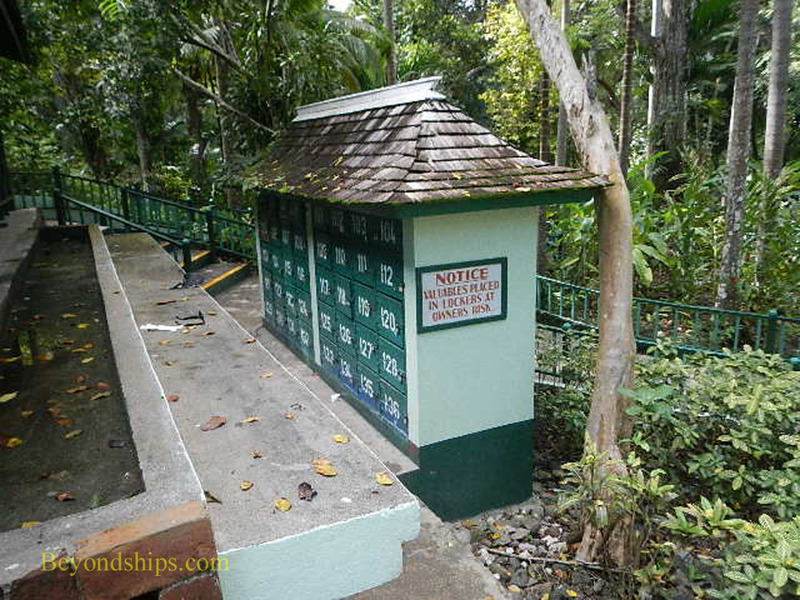 Below right: At various points along the river, there are entrances/exits where visitors can go from the path to the river and vice versa.